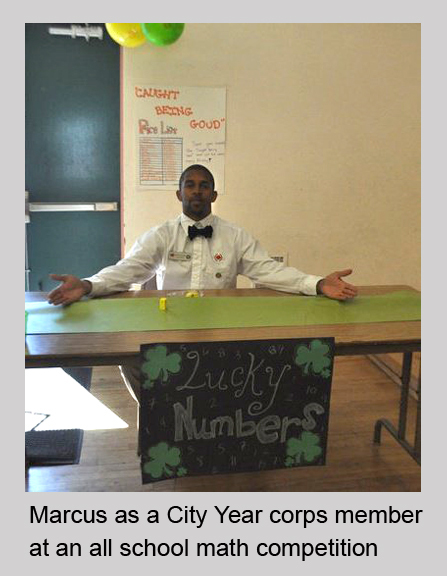 After graduating from The University of Redlands, Marcus served as a corps member and senior corps member with City Year Los Angeles where he wrote lesson plans and delivered after school programming in an elementary school, and organized service days to engage local middle and high school students through curriculum focused on social justice and equality issues. Today, Marcus is building on the impact he began with City Year as a Teach for America corps member in Orangeburg, SC. He teaches 10th and 11th grade chemistry and physical science and is an assistant coach on the baseball team. Marcus has found that the skills he acquired while with City Year have enabled him to motivate his students and maximize their potential as learners, as well as his own potential as an educator. Marcus encourages all corps members and alumni considering applying to Teach for America to take time to reflect on what motivated you join City Year and what do you want to accomplish as a teacher. This perspective will not only help you during the application process and Summer Institute but keep you focused day to day in the classroom. To learn more about the Career Partnership with Teach for America, click here.